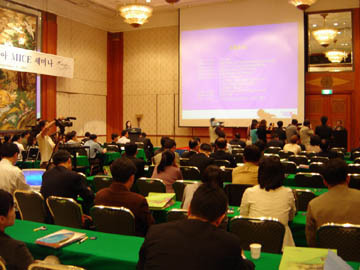 A Malaysia tour promotion event is under way at Grand Ballroom of Millenium Hilton Hotel in Seoul on Sept. 22, 2004. In this tropical paradise, travelers will experience a diversity of Asian cultures in one single destination. From the people to the food, sights and sounds; Malaysia is a unique melting pot in Asia. The Malaysian government with various hotels, and Malaysia Airlines conducted a press conference at the Millennium Seoul Hilton on September 22 to promote not only travel for individuals and groups but also business travel. The group which was composed of Malaysian Ambassador to South Korea Dato' M. Santhananaban, Director of the Malaysian Tourism Promotion Board Abdul Mutalib Awang, and Area Manager for South Korea of Malaysia Airlines H.J. Helmi H.J. Daud outlined various aggressive promotional plans for companies in South Korea that are interesting in using Malaysia for meetings, incentives, conventions and exhibitions (MICE). Between Santhananaban, Awang, Daud and their group of presenters they descried Malaysia as a pleasant, hassle-free country for companies interested in MICE. 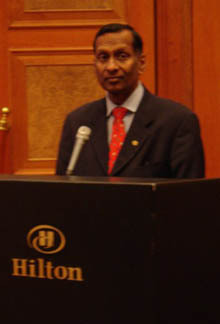 Mr. Dato' M. Santhananaban, Malaysian ambassador to Seoul, delivers welcoming address to about 300 participants at Grand Ballroom of Millenium Hilton Hotel in Seoul on Sept. 22, 2004. Santhananaban described Malaysia as a buoyant and wealthy country that has moved towards a pluralist culture based on a vibrant and interesting fusion of Malay, Chinese, Indian and indigenous cultures and customs. With her success in staging large-scale conferences, Malaysia positioned itself as a strategic destination for exhibitions and conventions. Within easy access from most parts of the world, Malaysia is served by a large network of international airlines and is internally linked to various parts of the country by an efficient mode of domestic air services, port facilities, an intensive railway system and elaborate road networks. Today, Malaysia is increasingly viewed as a prime exhibition and convention venue, which offers professional expertise backed by sophisticated support services and attractive tourist places. Malaysia with her unique blend of a harmonious multiculturalism and tropical paradise is among the top 21 MICE locations worldwide and is positioning itself to become the hub for the MICE market in South East Asia. 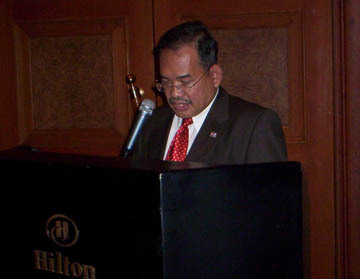 Mr. Abdul Mutalib Awang, director of Malaysia Tourism Promotion Board, is addressing a group of both Korean and foreigners from travel industry in an event held at Millenium Hilton Hotel on Sept. 22, 2004 to promote tourism in the South East Asian country. Malaysia Airlines offers seven direct flights per week from Incheon Airport to Kuala Lumpur and is set to help travelers in all their traveling needs like visas, customized incentive group packages and can even upgrade scheduled flights to meet special commitments. The above photos were taken by Ms. Kim Sun-Young, who serves as ST staff reporter.